On the left Chocolate the Cat. 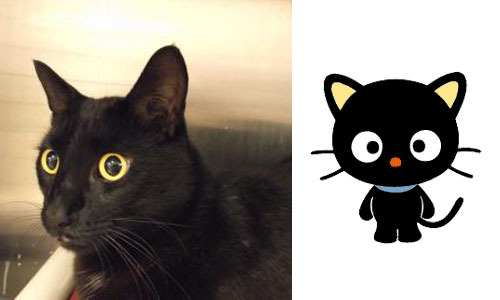 On the right, Chococat. Striking similarity, I think! Chocolate is a beautiful, 6-year-old male black cat. Chocolate is at Lollypop Farm for a second time through no fault of his own. Originally, he was here because his owners had too many cats and now, six years later, he is back because his owners were moving and could not take him along. This handsome boy is a curious kitty who likes to play with toys but isn't fond of thunderstorms. He is front declawed, so he is looking for a new home where he can stay inside. Chocolate is eligible for our Seniors-for-Seniors program, so adopters age 60 and older can take him home free of charge. Chocolate is also one of our Featured Felines: Black Cats. Now through Friday (9/2), adopt him for just $35, or any other black cat, 5 months or older! This sweet boy wants to meet you today! Genny, the dog from last week is still waiting to be adopted.